What is “Search Other Sites”? 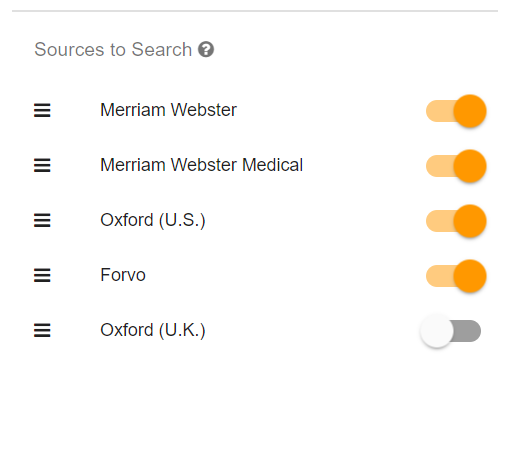 Unlike the main Sources or online dictionaries that are able to be searched directly and in bulk (Oxford, Merriam Webster, etc…), these are online sources that don’t allow us to connect directly to their database. They may still provide the information you need, however, so this drop down list provides pre-built links to them. You can click on as many Other Sites as you would like and a new tab will open for each. Depending on your browser, you will probably have to click “allow popups” or a similar permission the first time you do this. Pronounceology uses these sources, or online dictionaries, to search for your terms. It uses a “cascading” style to search, meaning it looks to bring you one result. This means the order of your sources will be the order it looks – if it finds your search term in the first or second source in the list, it will not look for that term in the others. In the example below, Pronounceology starts with Merriam Webster, then goes on down the list. Make sure turn off any sources you don’t want to use. When starting a new search report, there a number of options you can turn off and on to help you. They all modify your list of search terms after extracting them from a list, spreadsheet, or PDF. Naturally Pronounceology will search for the hyphenated term which will not actually be recognized by the dictionaries. While turning this option on may catch a few words that are actually hyphenated and remove the hyphen, these will most likely be few and far between. 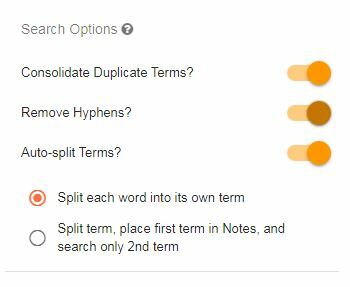 This option will take multi-word terms and automatically split them into single terms, searching each one. Use this with caution with the nature of your list in mind, as it could create many more entries. The second sub-option: “Split term, place first term in Notes, and search only 2nd term” is designed mainly for proper names, where you do not really need to search the first name in “David Brobagaccionchiee,” for example.